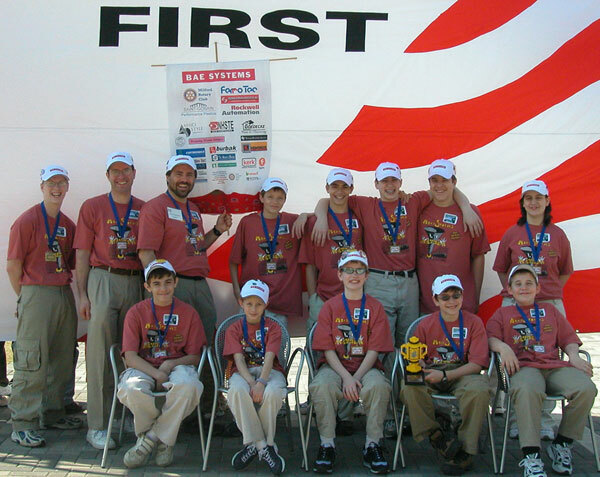 The Mindstorms Mayhem team of homeschooled students who won the national LEGO title is, top from left, mentor Christopher Jennings of Merrimack; coach Ken Streeter of Bedford; coach Bill Gray of Milford; Nathan Gray of Milford; Benjamin Krupkin of Milford; Brian Jennings of Merrimack; Benjamin Streeter of Bedford; Victoria Umenhofer of Wilton. Bottom, Jacob Krupkin of Milford; Melissa Gray of Milford; David Schunemann of Hollis; Nathan Streeter of Bedford, and Daniel Umenhofer of Wilton. The homeschooled kids from several southern New Hampshire communities ran into a number of setbacks with their robot, and they were facing the best teams from 39 states and five nations, so any setback could be a disaster. But by the end of the competition in the Georgia Dome in Atlanta last week, the Mayhem kids turned things around and won it all - the director's award as the top team in the competition. To get to the international competition, Mindstorms Mayhem kids, who met each other through their churches, beat 47 teams from throughout New Hampshire. Coach Bill Gray said they knew they had a good robot and were well prepared for a research presentation on geothermal power. "We did a lot of work polishing the research presentation and they really nailed it," said Gray. "On the question and answer part they did the best I ever saw them do." The real challenges were the unexpected ones: LEGO attachments for their robot were carefully packed with bubble wrap in duffle bags for the trip. When team members got to the Georgia Dome they opened up their bags to find that airport security had taken each apart, leaving piles of LEGOs and only 45 minutes until competition. As if that weren't enough, Mindstorms Mayhem was the first to be judged in each competition. The kids felt rushed, and they worried that after the other presentations, they would be forgotten. "The competition was really stiff," said Ben Streeter. "After the first day, I didn't think we had a chance." Their worries ended when, on Friday morning, they were called back for the second round. "We were really surprised," said Melissa Gray. From there it only got better, and on Saturday the team got the director's award for the most well-rounded team that excels in all judging categories. "We are all kind of floored," said Nancy Streeter, the mother of team members Ben and Nathan, and wife of coach Ken. "It's just incredible, and we are very proud of the team and the coaches." "I'm really proud of them and how they developed over the season," said Gray. "They came a long way." The team attributes its win to faith and teamwork. "Everything comes from the Lord and he blessed us," said Ben Streeter. "We really worked well as a team, too." Still, being international champs hasn't sunk in. "It's a real honor but I still can't believe it," said Ben Streeter. "It hasn't sunk in yet that we are the best in the world." Some of the members of the team are now too old for the FIRST LEGO League but if all goes well, the world may soon have to contend with two local homeschool teams.